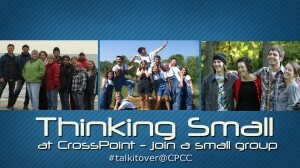 Get connected at CrossPoint! We have a variety of small groups to choose from. A place that’s just right for you! The psalmist says “Let all the trees of the forest sing for joy,” and “the heavens declare the glory of God.” This group meets once a month on a Saturday for an outdoor activity such as birding, hiking, walking, and visiting parks, followed by an informal meeting at a local coffee shop where we discuss what we saw. This group is perfect for nature lovers! Click here for info on the next ACS outing. Going Deeper (for adults of all ages) – Meeting Sunday evenings at 6 pm in the lobby here at CrossPoint. Talk it over and dig deeper into the Sunday morning messages. Contact Pastor Mike at the church office (419-729-0733) for more information on this group. Adults of all ages are welcome at this group! Meeting the 1st & 3rd Thursdays of each month for study and sharing. Contact the church office at 419-729-0733 for more information. Men’s Group – for men of all ages, the men’s group is a great way to get to know each other through a variety of fun outings such as cycling through downtown Toledo, fishing at the Maumee river, and meeting together for study, relevant discussions, and lots of laughs. Prayer Team – meets once a week at CrossPoint. We pray for the needs of CrossPoint and the Point Place community in a “round table” format of prayer. You can pray silently, or voice your prayers with the team, however you are comfortable. Can’t commit to every week? Come and pray with the team whenever you can. Yadah Sisterhood – The definition of Yadah is uninhibited praise! For ladies of all ages, you’ll find lively discussion, new insight, lots of laughs, and great friendships at these fun groups. Meeting at CrossPoint, you can choose to join the Wednesday evening group from 6:30-8:30 pm, or the Friday morning group from 10 am-12 pm. We hope you’ll join us! Young adults – For singles and young couples, this group meets Friday evenings at 7 pm. We alternate between group study and group events. One of the things we love doing is Ethnic Food Night. See our Facebook page for more information. Call 419-729-0733 for more information about any of our small groups.